The new Vulcan anchor is Rocna's first major design development since the launch of the highly successful and acclaimed Rocna anchor itself. The Vulcan is carefully designed to offer the greatest possible compatibility across a wider range of vessel bow configurations, particularly powerboats with a bow pulpit. It brings the security and reliability of the Rocna anchor, highly successful and popular with offshore cruisers and adventurers, to a wider range of boaters who we believe desire improved anchoring performance. The original Rocna has set the bar for the highest performance and consistency of behaviour when put to the test both by a worldwide array of users and in numerous independent tests. This performance is the result of careful design and engineering by Peter, who has again put to work all of his knowledge and experience to develop a variation on the theme of the ultimate anchor. The new Vulcan capitalizes on already finely tuned design elements, infusing many of its elder sibling's proven performance advantages for an extremely quick and reliable set across a range of seabeds combined with rock solid holding power. Breaking from the Rocna design the Vulcan features a unique combination of shank and fluke geometry - including an innovative roll-palm A at the rear of the fluke - which self-rights the anchor on the seabed without the use of a roll-bar. This is assisted by the V-bulb B which extends fluke ballast downward to gain maximum leverage and efficiency. This development permits a larger fluke surface area than competing designs which rely on simple dead weight, while the concave fluke C is similar in design to the Rocna, directly equating to more holding power and security. The omission of a roll-bar along with a carefully designed shank profile D ensures a snug fit on the bows of a widely expanded range of vessels. Platforms, bowsprits, prods, stays, and other protrusions are easily cleared with no hassle or inconvenience. 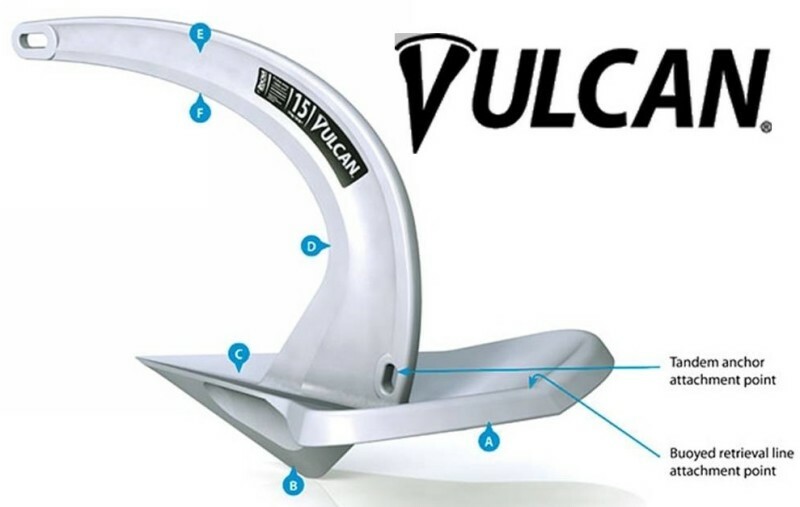 The Vulcan's shank shape D encourages self-launching and self-stowing upon retrieval on the majority of bow rollers, with a liquid smooth action, ensuring ease of use for all operators. In addition to the use of high tensile steel, shank strength is optimized by a unique I+V profile shank design E, granting improved resistance to bending courtesy of a computer optimized I-beam geometry. This visually elegant innovation also improves setting performance, with the lower V edge F cutting into the seabed and minimizing resistance to a deep and secure burial. Embodying the rugged strength and elegant designs of its namesake - the ancient god of fire and metal smithery - the Vulcan is milled from the heritage of the Rocna anchor and the demands of innovation. Formed from high strength steels or stainless steels, and finished with the utmost attention to detail and quality. 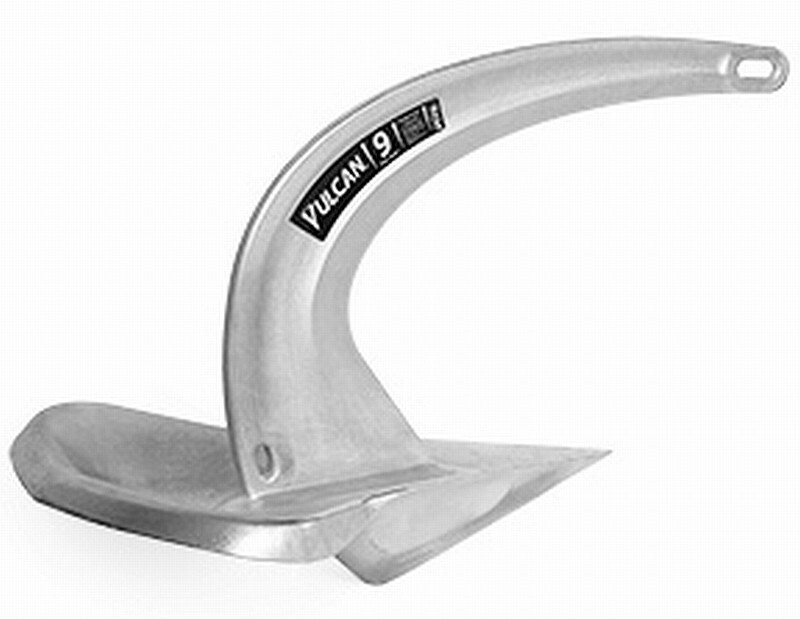 Like the Rocna, each Vulcan anchor comes with a Lifetime Warranty against both breakage and bending in addition to manufacturing defects. Vulcan anchors are available in 10 sizes from 4 kg 9 lb - 55 kg 121 lb to suit vessels from small runabouts to larger launches. Galvanized and stainless steel options are available in all sizes.